As California struggles with a housing shortage crisis, developers are still finding vacant spots in Citrus Heights to tuck new housing into — with several hundred homes and housing units either approved or proposed to be constructed in the near future. The most major project currently under review is a 260-unit proposal off Arcadia Drive, near Sunrise Boulevard and Greenback Lane. The project is set to be considered for approval by the city’s planning commission this Wednesday. Other housing projects in the city include a 42-unit development behind Bearpaw’s corporate headquarters at Sylvan Corners that was approved earlier this year, along with a 23-home development off Sunrise Boulevard at 7878 Lawrence Ave. — although that project appears to have stalled sometime after it was approved in 2016. Work has also begun on a 46-home development at 5555 Mariposa Ave., and a proposal is currently under review to build eight new single-family homes on a small lot next to Walmart on Auburn Boulevard. 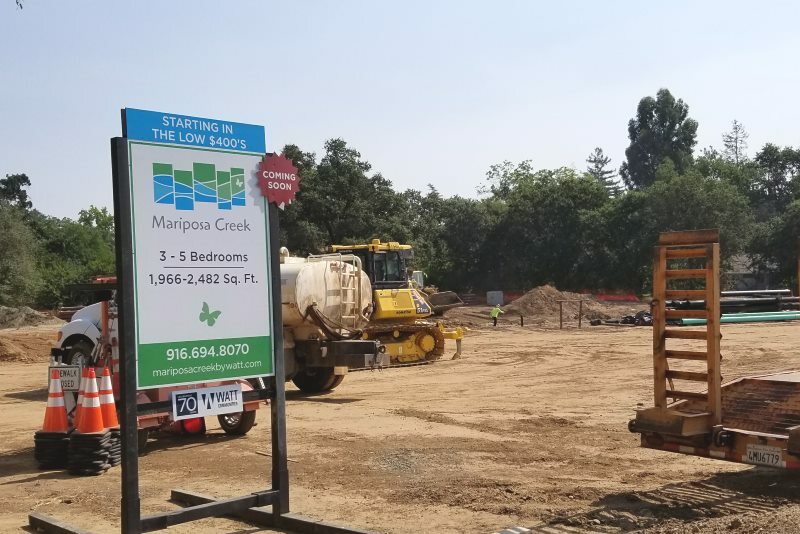 First on schedule for completion is Watt Communities’ new Mariposa Creek development, a project that will bring 15 new single-family homes to 7625 Antelope Rd., near Mariposa Avenue, on what the city council had once identified as a “preferred site” to build a new city hall back in 2014. Earth-moving equipment has been at the 3.5-acre site for several months, and Kevin Webb, Northern California division president for Watt Communities, told The Sentinel construction of the homes is on schedule to begin next month, with homes slated to be sold and completed by December of this year. Webb said prices will be in the lower $400,000-range, with single-story options featuring a 1,966-square-foot floor plan, three bedrooms and a two-car garage, according to Watt Communities’ website. Two-story options will feature a larger layout of around 2,500-square-feet, with four bedrooms and a loft, along with three bathrooms and a two-car garage. As reported by The Sentinel earlier this month, the Mariposa Creek development will also include a new street, Turner Court, named in honor of the late Councilman Mel Turner, who passed away while serving his second term in office last year. Watt Communities is also the company which has proposed the massive, 56-acre Mitchell Farms development off Arcadia Drive, where the Sunrise Golf Course currently operates. Since being proposed in 2016, an extensive environmental review was undertaken that took nearly a year to complete and generated a 1,000-plus page environmental impact report, as required by the California Environmental Quality Act. The housing is planned to be spread out into three general communities, with a large 23-acre swath down the middle remaining undeveloped due to a 100-year flood plain associated with Arcade Creek. According to the latest map of the proposal, the development would be accessible through two entrances on Arcadia Drive, with a roundabout, as well as an entrance on Fair Oaks Boulevard, just south of the Heather Downs apartment complex. Proposed 260-unit Mitchell Farms development. Webb previously told The Sentinel that prices will range from the “high 2’s to low 4’s,” with sizes ranging from 1,400-square-feet to 2,500-square-feet. He said “cluster units” are proposed to feature a master bedroom downstairs and be targeted towards seniors, while other single-family homes and units would be targeted towards first-time home buyers and new families. All homes would be governed by a home owners association. The initial proposal has undergone some changes — including a minor reduction in the number of units to 260, as well as a connector road in the development no longer being proposed to handle vehicle traffic, according to the agenda packet for the upcoming planning commission meeting. During a public hearing held in April regarding the draft environmental impact report, two residents spoke and addressed concerns regarding public safety, fire and flooding, as well as noise along Sunrise Boulevard. Nancy Graham, president of the area’s neighborhood association also wrote a letter to the city stating concerns about a perceived lack of privacy and security for homes along Arcadia drive that are proposed to face towards the street, rather than facing in with a wall along Arcadia. She also noted concerns about added traffic on Fair Oaks Boulevard and suggested more fencing and gates to reduce access for homeless who may want to camp in the greenbelt that would run through the development. At the July 18 meeting, planning commissioners will consider approving a general plan and zoning code amendment related to the project, along with approving a tentative subdivision map, design review and tree permits, and certification of the project’s environmental impact report. The meeting will be held at city hall at 7 p.m.